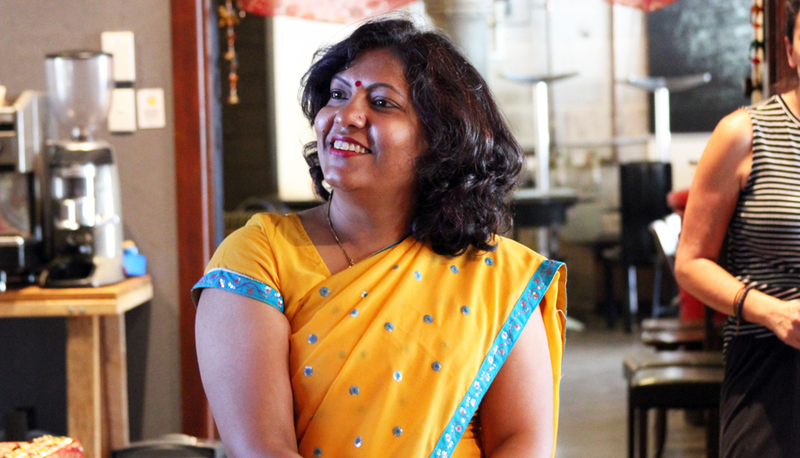 Anamika is a woman of many talents; she is an artist, a performer, a facilitator and a brilliant cook. Most recently, Anamika hosted a special Indian Family Feasting event in partnership with Community Minds. On a busy day, I got a phone call from Yamane Fayed. I thought that she wanted some updates of Didi’s Tribe, but she called me for another exciting project; an Indian Feasting event. As always, I trusted her completely, because she always comes with amazing projects. I accepted this exciting challenge and we met with the Director of Community Minds, Zizi Charida. I shared my plans for the day and tried to understand the expectations from Zizi. I love cooking and I always cook for my family and friends. But this was different as I was representing my country, my culture; it made me little nervous. I was going to be the cook, the event planner and the host for the day. I asked myself how I would manage it all and I found the answer: my family promised me that they would help me to make this event a success. I started my preparation planning 15 days ahead of the event. I planned Indian decorations, Indian games, very traditional welcome drinks, the starter, Indian food and Indian return gift, then I headed to the Indian Supermarket in Liverpool to begin my shopping. I planned several fun games for everyone, the first of which is called ‘Urr’, a Hindi word for “flying”. My handsome son, Prakhar, played an interesting quiz based on Indian facts and trivia. He shared various interesting facts about India and felt really proud; my younger son, Pranshu, was helping out too. Finally, we played Game of Spices; a game based on the aroma of Indian spices. I had small fabric pouches with different spices and everyone had to guess the name by smell alone. From the games there were four lucky winners who received Indian prizes: an Indian kadai bowl, decorated terracotta diya, incense cones and an artificial Lotus (India’s national flower). I also prepared a song for the day. I sang in Hindi and then I translated it and sang in English so my guests could understand. I received lots of positive feedback. Guests couldn’t decide which dish was their favourite. Some ladies asked me to start cooking classes! By the end of the event I was very tired, I was up at 3am to cook everything fresh for the day! But I was also very happy and satisfied, I couldn’t have planned that day better any better. My special thanks to Yamane and Honey Singh for helping me to make the event a big success. Last but not least, I want to thank my life partner Awadh Kishore for his continuous help and support.